The country best known for its clean, modern, on-time trains, Switzerland offers visitors an incomparable way to experience the countryside. Couples you can go from point to point at their leisure or speedily. In fact, vacationers in Switzerland can ride from mountaintop to balmy beach by train in less than two hours. Imagine skiing in the morning at Engelberg, attending the Zurich Opera at night, and leaving the details to the highly efficient and dependable Swiss Travel System? Legendary among trains, the luxurious Orient-Express operates trains on three continents. But it is the iconic Venice Simplon-Orient-Express that conjures the most romantic thoughts of cuddling in a posh cabin suite, savoring sumptuous cuisine, and falling asleep to rhythm of the rails as they carry you from Venice, through the Alps, and into Paris. Arrive at the Grand Canyon aboard the classic Grand Canyon Railway, a fully restored, circa 1923 steam train that picks up passengers and carries them 64 miles to the Grand Canyon National Park's South Rim for a day to remember. It's a completely relaxing, no-stress, romantic way to reach the park, especially since during the journey musicians entertain and free refreshments are offered. 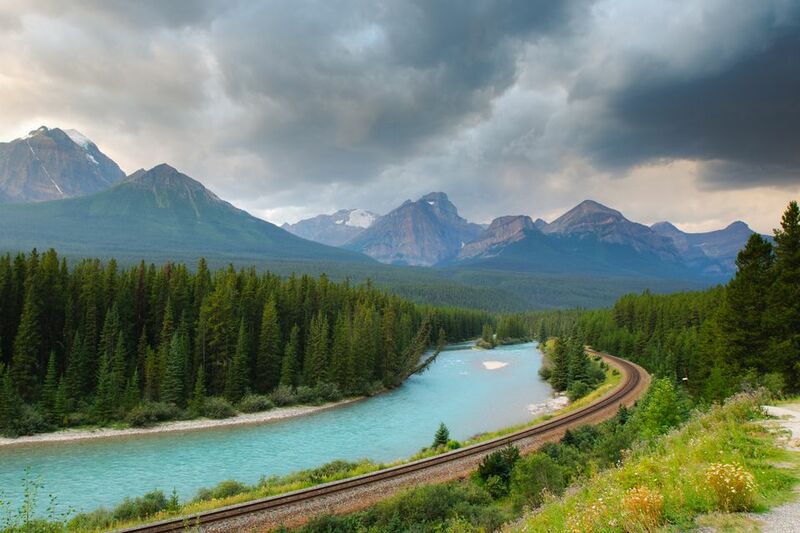 Via Rail operates trains in the Rockies, along the Pacific, through the prairies and northern Manitoba, in Ontario and Quebec, and through the Atlantic region. For the most romantic train ride of all, opt for Romance by Rail service that carries a couple in the ultimate luxury of a private cabin with a double bed and twin ensuite bathrooms. If you're a fan of classic movies and have watched Alfred Hitchcock's North by Northwest, you've seen the glorious Hudson River and the mountains beyond it through the windows of a train whose tracks hug the riverbanks. The rail line, Metro North, is actually a commuter train with world-class scenery, and many couples who visit or live in New York City board it for the day to take an easy, fast, and convenient trip to Hudson Valley towns such as Cold Spring or Hudson. There they can walk from the train station into town and find places to eat and antiques stores to browse. Set in a verdant valley of the River Len in the heart of the English countryside, the thirteenth-century Leeds Castle is a thoroughly romantic location. Couples who want to visit it in style can do so by taking a train ride aboard the British Pullman. They can walk the grounds, tour the castle, have a snack, try navigating the maze, pop into the aviary, and even paw through the unique Dog Collar Museum. A railway that is as much an engineering marvel today as it was when it launched more than 90 years ago, Mexico's 390-mile-long Copper Canyon Train traverses rugged terrain with 87 tunnels and 37 bridges over a land mass four times as big as the Grand Canyon and some 300 feet deeper. The journey connecting Chihuahua with Mexico's Pacific Coast takes about 14 hours and couples can stop along the way to spend a night in a hotel or hacienda before continuing on one of the world's most thrilling train rides.